Remember the advice Lieutenant Dan gave to Forest Gump? Take care of your feet! And don’t get yourself killed… We sincerely hope the latter isn’t a real concern. After all, American hiking trails aren’t as dangerous as Nam. But, what do we know, we weren’t there, man! 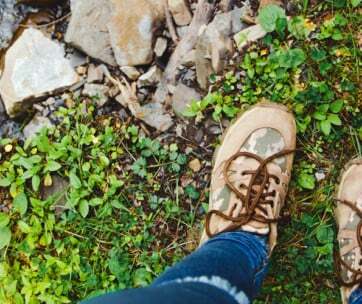 What we actually know is how to take a good care of your feet while hiking. If something goes wrong with your feet, your whole hiking adventure can go downhill. But, not only that, problems with feet caused by hiking can make you bedridden for days. Moreover, if the issue is serious, it can leave a lifelong effect. But, there’s some good news about this. Preventing problems with feet is actually pretty easy. With a good care, your feet are gonna stay healthy, allowing you to hike over hundreds of miles. So, what are you supposed to do to ensure your feet remain in a good condition? Well, first of all, you need to get yourself comfy footwear. Get the Boots that Fit! 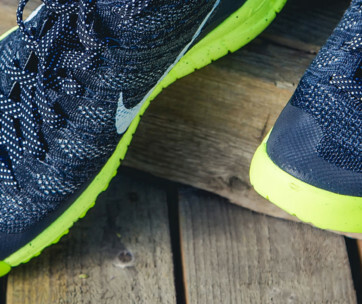 Taking care of your feet is something that needs to start long before your hiking trip. You need to buy a pair of quality hiking boots at least weeks before the adventure. Why? Because the boots need to be broken-in. Otherwise, the chance that you’ll end up with blisters is huge. Of course, you won’t be able to break-in the boots if you’ve picked the wrong size. To prevent that, you need to pay attention that the back of your foot sits tightly against the heel of the boot. The toes, on the other hand, need to have some wiggle room. You then need to walk a few steps to test whether the foot is sliding around inside the boot. And we have another useful advice for you on how to find your ideal pair of hiking boots. You should try them on in the late afternoon. This may sound strange but is actually pretty logical. It’s because the chance is that your feet and legs will be swollen after walking around all day. Having swollen feet while trying out hiking boots is a good thing, as they’re gonna be even more swollen during hiking. And if you’ve been sitting all day, our advice is to hit the gym for a leg workout before you go shoe-shopping. Another trick to pick the right size of the hiking boots is to wear the kind of socks you’re gonna wear on your hiking adventure. This way, there’s absolutely no way you’ll end up buying boots that are too tight. 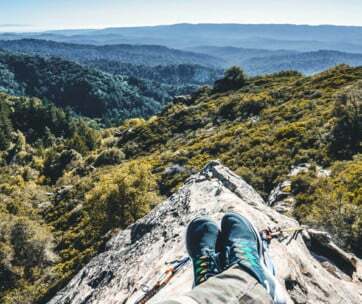 Good hiking boots are made of breathable materials and usually come with tiny holes that let your feet get some air. But, this doesn’t mean you will feel comfy if you keep them on all the time. You need to take the boots off each time you’re making a break. By giving your feet some air, you will cool them off, making it much easier for you to keep on hiking. You can also take this opportunity to get rid of all debris that might have ended up in your boots, as well as to dry your socks as they’re likely to be soaked in sweat. Speaking of socks, if you can’t dry them, you need to put on a new pair. 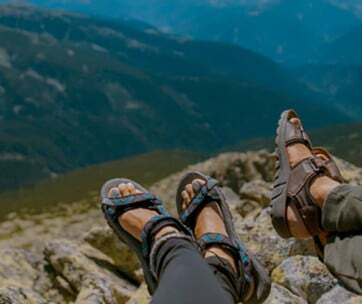 And if you are not a fan of boots and would like to give your feet even more air while hiking, then make sure you read our hiking sandals review or our water shoes for hiking review. Modern socks were invented for the military purposes. Wet boots equal trench foot, which is why the army had to do something about it. Soldiers used to wear them to prevent excessive moisture from developing inside their boots. Well, hikers are using the socks for basically the same purpose. A good pair of socks will absorb the moisture created either by your sweat or by rain. They will also provide you some cushioning, improving your overall comfort. But, having only one pair of hiking socks won’t do you any good. They’re bound to get soaking wet at one point, no matter how good they are. And when they get wet, they will become a perfect home for bacteria and fungi. So, if you persist on hiking with damp socks, you’re risking developing a condition like athlete’s foot, for example. But, that’s the least of your immediate concerns. 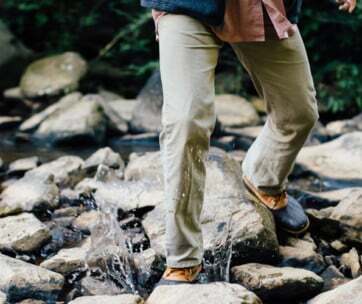 Wet socks will make your skin softer, meaning that it will tear more easily. In turn, you might end up with cuts and wounds, as well as painful blisters. We understand that for some people hiking is a way of fun. But, if you’re messing around, you might end up falling, twisting your ankles, breaking your toes, and so on. That’s why you need to keep your eyes on the ground! You also need to pay attention to what the group leader is saying, as well as to note the warnings of those hiking in front of you. You can be sure that they will warn you if the terrain is slippery; it’s how the hiker’s comradery works. Another good advice to prevent foot injuries while hiking is to shorten your stride. This goes double in cases when you are going up or down a slippery slope. If you miss a step, you won’t find it too difficult to maintain your balance. Probably the best advice we can give you is to have a first-aid kit in your backpack. So, even if you get injured, you can prevent it from getting even worse. And if it’s a small injury, you will be able to deal with it and get back to hiking ASAP. We also advise you to have some pain-killers in the kit. If you, or some of your hiking buddies, sustain a serious injury, like a broken bone, God forbid, it may take hours to get to the hospital. And even a minute in such agony is too much. Pain-killing medicine can certainly help. 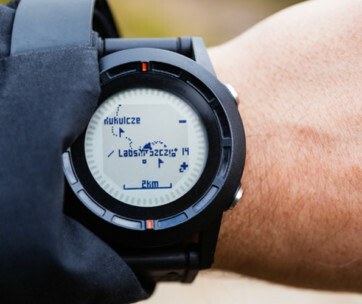 The final tip we have for you is not to go hiking without your smartphone. You can use it to call for help if you end up with a nasty foot injury.